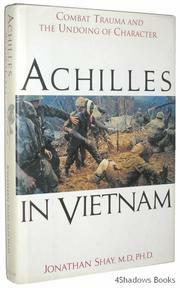  In a brilliantly creative extended analogy, psychiatrist Shay (Tufts Medical School) persuasively argues that the experiences and behavior of traumatized Vietnam veterans echo those of Achilles in Homer's Iliad. Shay's ``principal concern is to put before the public an understanding of the specific nature of catastrophic war experiences'' that ``can ruin good character.'' He follows the Iliad closely, showing how Achilles' character, like those of modern veterans, gradually disintegrates under the pressure of organized combat: Arbitrary command decisions (e.g., the seizure by Agamemnon of a war prize voted Achilles by his fellow warriors or the capricious assignment of a GI by a superior to hazardous duty) betray the soldier's sense of fairness and fuel his incipient rage. In combat, the soldier's social and moral horizon then shrinks to a small group of trusted companions, like the Vietnam soldier's ``buddy'' or Achilles' beloved friend Patroklos. Under the stress of combat, the soldier's rage, grief, and sense of abandonment and disconnection culminate in a ``berserk'' state in which he commits successive atrocities. Using first-person accounts of Vietnam veterans, Shay compares each aspect of Achilles' moral deterioration with the veterans' strikingly similar experiences. The author expresses cautious hope that survivors of severe trauma can recover to some degree (although many veterans' lives seem permanently blighted by their Vietnam experiences). He makes some recommendations for ameliorating the worst effects of severe combat trauma; among these are the preservation of unit cohesion throughout the combat experience (rather than, as in Vietnam, rotating individuals into and out of units while engaged in combat) and reform of motivational techniques used by officers in combat. A heart-rending look at the permanent ruin war can wreak in any age.